DAIHAIQKO provide a wide selection of unique designer fashion products for the most playful member of your family( canine and feline ). Such as study durable and comfortable pet collars and leashes; portable collapsible pet travel bowls and dog training whistles. More new product will come online soon. For more, Please search DAIHAQIKO or click the DAIHAQIKO link at the top of the page to browse our product list. Double D-ring for better attaching leash and dog ID tags, let walking more convenient. All of the careful design is only for a perfect collar, that is comfortable, durable, beautiful and stylish. This collar is a single product, but it comes with matching leash to complete the look, leash ( B078JCR83M ) sold separately. S - total length 22", width 1", thickness1/5", for neck 16"-20", best for medium dogs. M - total length 25", width 1.2", thickness 1/5", for neck 17"-23", best for large dogs. L - total length 29", width 1.4", thickness 1/5", for neck 20"-27", best for extra large dogs. All pictures are take with our collar of M size, please measure the circumference of pet's neck before purchase. 1 year warranty and 60 days unconditional refund. 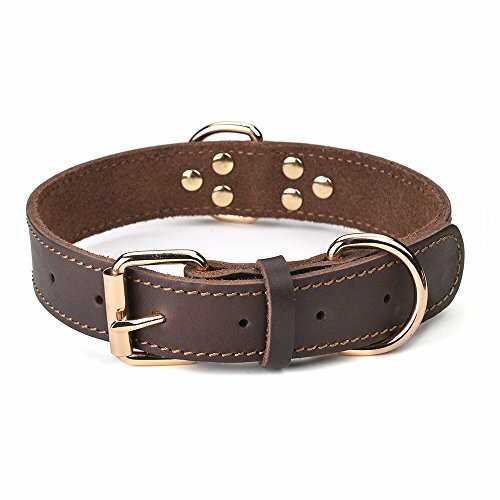 COLLAR SIZE - For neck 17-23 inch, width 1.2 inch, best for large dogs like Labrador, Golden Retriever and Germen Shepherd etc. GENUINE LEATHER - This is a typical all-leather collar, provides supreme flexibility and comfort for your pups. Quality genuine leather for durability and luxurious style. ALLOY HARDWARE - The bright buckle and D-ring are made of solid alloy, coated with eco-friendly brass color for beautiful and prevent rust. DOUBLE D-RING - Practical design, one for attaching the dog leash, the other for the ID tag. More convenient for walking. EXCELLENT QUALITY - Multiple rivets combines handmade stitching let the collar more reliable and looks more pretty. You will never worry about the collar will break or fall off, safety and secure. View More In Basic Collars. If you have any questions about this product by DAIHAQIKO, contact us by completing and submitting the form below. If you are looking for a specif part number, please include it with your message.